Striving to Abide in Christ: Scheduled days are the best! A little of this and a little of that! I'm striving to be a Proverbs 31 woman! I'm loving my family and working from home! You'll also find THM recipes here! Hope you enjoy your visit! Click here to check me out on facebook! 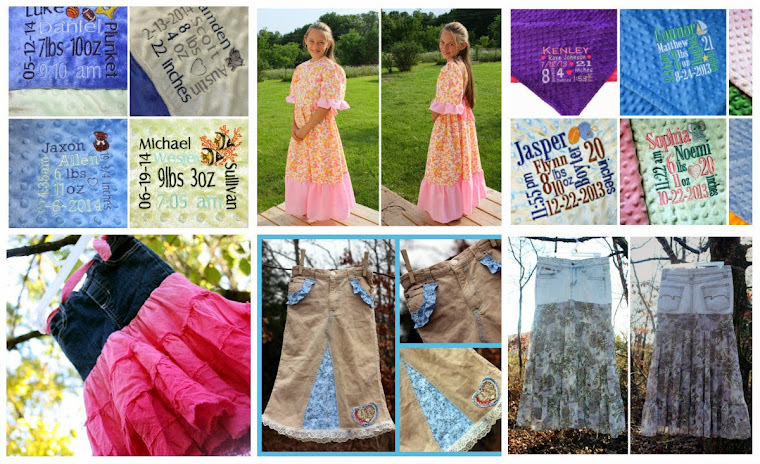 Adorable personalized keepsake blankets, stylish & modest custom made jean skirts, and more!!! Scheduled days are the best! Spring is here and it is great! We have some beautiful flowering trees! We also have some work to do with our garden but I did start seeds this year and am so happy about that! Our days are going so much more smoothly now! We have started our schedule and it is a blessing! We get up at 6am and have a full day! I am praising the Lord that I can wake up at 6am. I have been eating with a raw focus again and feel so much better. Whenever I start to listen to people who tell me about all the protien I need and I start eating that way again I just feel lousy. I need to just follow what I know makes me feel good. I am 27 weeks pregnant and due July 8th! We are expecting another precious baby boy! Very exciting! I am thankful to be in the country where my boys can be boys! They need baths every single day! We found out a couple of weeks ago that my dad has terminal lung/kidney cancer. I shouldn't have been surprised and wasn't really but I didn't take it too well. I can't imagine life without him. Then I realized what a blessing it is for this to happen. My mom could have been calling to say that he had just been hit by a semi truck and was gone. But no, the Lord is so merciful and longsuffering. He is giving my dad this time to repent and come to truly know Him! I pray that my dad will truly surrender and come to the Lord. No pictures! Dial up is not the easiest to work with. I'm not sure what to do with pictures. It takes FOREVER!!!! Maybe someday! Have a blessed day following Jesus with all your heart! My name is Jenny and I am a daughter of the King! I have been married for almost 22 years, WOW! I have 9 wonderful children and one due in November 2016!